In the Thursday’s session, we continued to witness the corrective tendency of the Markets. Though the NIFTY50 remained in a capped range on expected lines, it continued to correct for the second day in a row. The Index ended the day losing 38.40 points or 0.36%. As we approach Friday’s trade, we expect this consolidating behavior of the Markets to continue. The elevated levels of NIFTY PCR (Put to Call Ratio) along with slightly stretched structure of the Markets might keep up move under check in the immediate short term. As we approach the Friday’s trade, we expect a tepid start to the trade. While we expect no major downsides, we expect some more consolidation happening which will be in fact healthy for the Markets. We expect the levels of 10710 and 10765 acting as resistance area while supports are expected to come in at 10630 and 10590 zones. 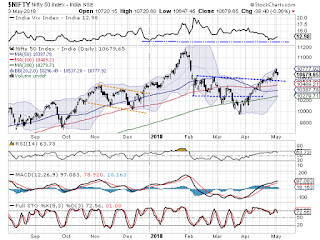 The Relative Strength Index – RSI on the Daily Chart is 63.7286. It continues to remain neutral showing no divergence against the price. Daily MACD stays bullish and remains above its signal line. No significant formation was observed on Candles apart from a black body. Thursday’s trade made evident that the Markets are suffering a short term throwback after breaking out from a rectangle formation with important supports existing in close vicinity. Overall, while expect consolidation to persist for some more time, we also need to factor in the VIX which remain at one of the lowest levels in recent times. This may have some more room for volatility to creep in as well. 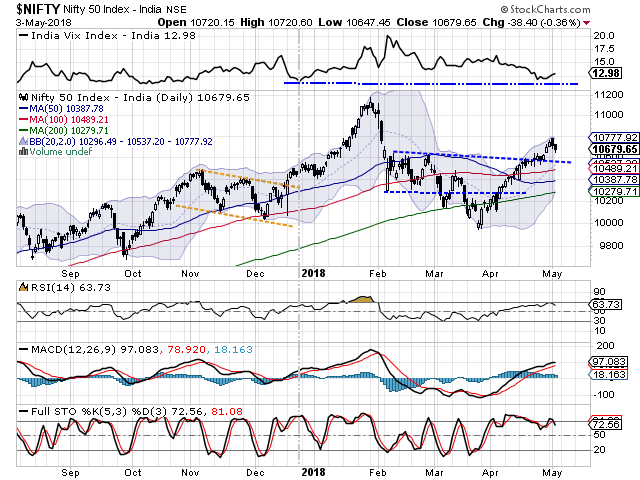 We reiterate that the way we are experiencing resilience as compared to global markets, we will continue to do so in near term and such range bound consolidation with limited downsides will make the current up move gather strength once again going ahead. We recommend refraining from creating shorts and continue to keep exposures at modest levels. Stock specific out-performance amid range bound consolidation will continue. Long positions were seen being added in stocks like SUN PHARMA, MANAPPURAM FINANCE, HDFC, ASHOK LEYLAND, AXIS BANK, VEDANTA, JINDAL STEEL, HINDALCO, TATA STEEL and CGPOWER.